In April 2015, Tim Harriger weighed 538 pounds. As of November 2016, Tim weighs 218 pounds. His journey to successfully resolve chronic health issues like high blood pressure and pre-diabetes began by joining the New Hope Y to get healthy and lose weight. 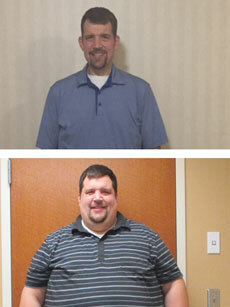 Today, Tim is working to continue to lose weight and running races as a way to stay focused on his goals. He ran his first 5k at the Y Run in April 2016 and has competed in two additional 5k races, plus a mini-triathlon in August 2016. He also appreciates the family-friendly environment at the Y—Tim’s whole family has enjoyed swimming and sports like basketball and soccer in an effort for everyone to live healthier.